Babies are welcome in all our classes! 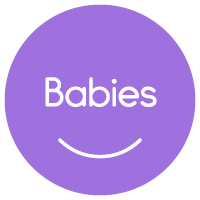 But if you would rather be with parents of other infants exclusively we have a one-semester Music Together® Babies Class created especially for families with infants under 12 months old. 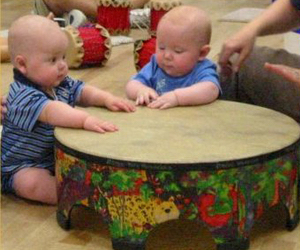 That’s right: It’s never too early to start our music classes! Music-making is a basic life skill, just like walking or talking. Although simply listening to music has its place in a well-rounded music education, it doesn’t support learning in the same way that active music-making experiences do. In your Music Together class, you’ll explore ways to make music with and for your baby, giving them the support they need to become the music-maker they were born to be. How Do You Know Your Baby Is Ready? Because they begin to hear and respond to sound in the womb, most babies’ sense of hearing is well developed at birth, and they are already alert to musical sounds—especially the voice of a parent singing! Just as your baby is prepared to learn language, they are equally prepared to learn music. Soon after birth, your baby may cry, giggle, coo, and squeal with excitement—all of which help prepare them for expressing themselves musically someday. They’re receptive to music, too. Studies show that babies perceive differences in loudness and melody, respond to tempo changes, and sense when a song is ending. They often move physically when music starts or stops and may show a startle response when the music ends—even in their sleep! Our music activities specifically designed to help you connect with your baby and support their music development. 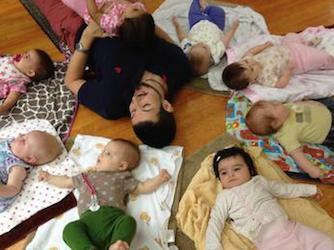 Music Together Babies Classes meet for 45 minutes once a week. Join us for class with your baby and set her on a path to a lifetime of music enjoyment---and start building friendships with other new parents in your neighborhood. Babies are always welcome in our Mixed-age classes too.